A traditional wreath—created by Joanna Policastro—welcomes visitors to the residence. The two front clay pots feature grapevine wreathes adorned with faux roses, satin ribbon and Lady Amherst feathers. Large pinecones create a base for trellises holding the wreathes. The pots were styled by Nancy Conner of Nancy Conner Design. Designers add holiday cheer and raise money for charity. Last November, some of New Jersey’s finest interior designers came together to create heartwarming holiday vignettes in a house that was part of the 2016 Holiday House Tour sponsored by Rebuilding Together North Jersey. The organization is dedicated to providing low-income homeowners with critical repairs and modifications needed to live safely in their homes. For information on the organization, rtnorthjersey.org. 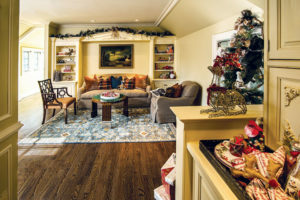 The holiday décor for this house was organized by the American Society of Interior Designers, New Jersey chapter. Have a look at these dazzling displays from the home. 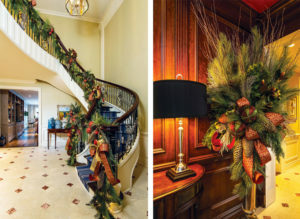 Left: The sweeping staircase gets a seasonal lift with a classically designed garland. The holiday décor in the foyer is traditional; its ribbon-and-ornament-bedecked garland of greenery designed to highlight the dramatic staircase. 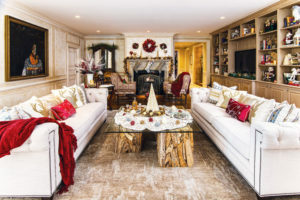 Joanna Policastro, who designed this space during her tenure at the Antique & Design Center in Upper Saddle River and who now owns Seasonal Surroundings in Waldwick, combined elements to create an ideal mix of festive finery. “In a project like this, you try to pull together different textures,” she says. Each part of the garland brings its own assets. “Ribbon is a soft component. Ornaments are a hard component.” Policastro urges restraint to avoid an overwrought look. Particularly in a traditional setting like this, she advises using “just two or three different components. 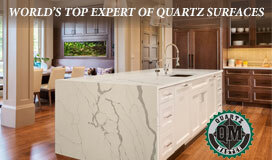 I don’t like to do more than that.” The result is a classic look suited to this classic space. SOURCES: holiday décor, The Antique & Design Center in Upper Saddle River. Left: The theme of gold and white complements the existing furnishings. Schwarz “had such a good time with the gift wrapping. I don’t normally get to do this. It was a great joy. Right: The space is all about family and “goodwill to all,” Schwarz says. A bountiful feast awaits in this family room. Judi Schwarz’s design for the family room is based on the idea that humans long for connection no matter what their faith or culture. “I don’t personally celebrate Christmas,” she says, but “my inspiration was family. 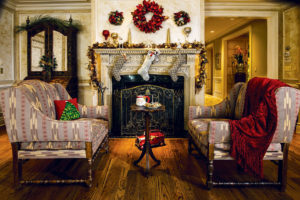 Family should be together.” She created a vignette based on the theme “Christmas Morning” and filled the space with everything a family would need to enjoy precious hours spent together. “It’s always food,” Schwarz says, laughing. The space features a gorgeously laid-out feast—from chocolates, cheese sticks and champagne on the bar to candies and muffins on the coffee table. Incorporating gold and white elements to complement the room’s décor, Schwarz included an assortment of artfully wrapped gifts. Hints of green appear in the garlands on the mantel and bar, on the stems of the white poinsettias and, of course, in the Christmas tree, says Schwarz, associate ASID. She added a menorah on the bar and brought a bit of whimsy with “Doris,” a wire sculpture that she often includes in her show house rooms. For this outing, Doris sports a Santa hat and cape. Though Schwarz may not celebrate this particular holiday, her design reflects a celebration of life that’s universal. SOURCE: holiday décor, Judi Schwarz. Silvers and blues coordinate with the wall color and contribute to a wintry atmosphere. It’s most certainly a blue Christmas in this bedroom, decorated for the holidays by Diane Durocher, ASID. Blue is the designer’s favorite color, so she was thrilled to see the wall color the first time she entered the room. “For a bedroom that was specific in palette, it was important for us to coordinate the decorations for a seamless flow.” She chose blue ornaments, but to balance the bold wall color she used a subtle shade, gently reflecting the room’s foundations. “We did Tiffany blue. We wanted the room to have a sense of elegance,” she says. She placed gifts wrapped in translucent versions of the hue beneath the tree. SOURCES: pillows, throws, and holiday décor from Home Goods, Pier 1 Imports, Michaels and The Antique & Design Center in Upper Saddle River. 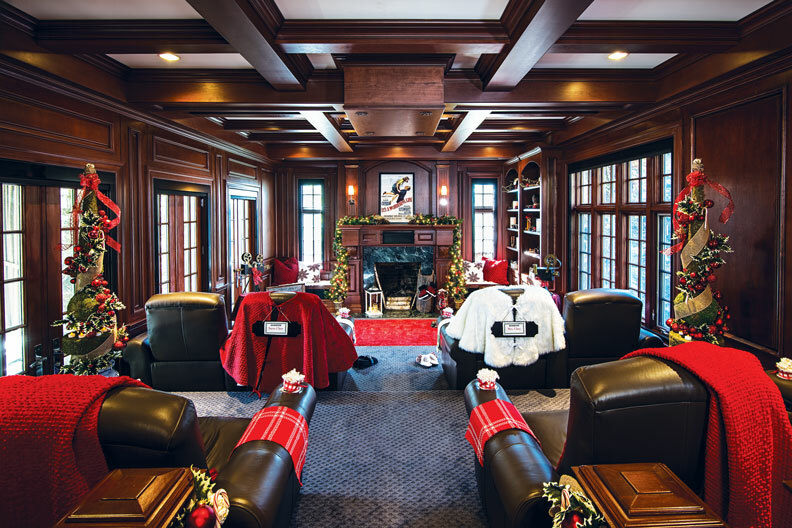 When designing this space, Denise Albanese envisioned movie night at the North Pole. “I thought, ‘what would Santa Claus’ theater look like?’” Obviously, it would need to keep out the winter chill. “I wanted it to be warm and cozy,” Albanese says. To that end, Albanese included blankets and slippers for husband and wife. She draped capes (made from Christmas tree skirts) for the Clauses over two seats. 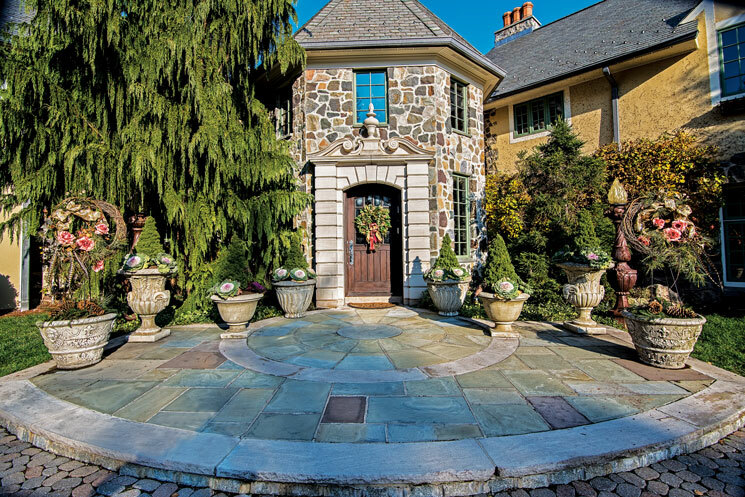 SOURCES: topiary and accessories, Interiors By Denise; carpet in front of fireplace, Rug Importers in Paramus; throws, Home Goods. Holiday planning is organized and efficient in this festive, yet functional space. Sharon Sherman, ASID, was interested in festive functionality when designing the office in the home. “For me, this space was a command center for Mrs. Claus,” Sherman says. The existing décor worked well with her theme. “It had beautiful upholstered walls and storage for all of the things she would need at her fingertips,” she adds. What the room lacked, though, were practical tech touches. “As a modern working woman, Mrs. Claus would have a computer to keep everything organized.” And due to the nature of the business, this office “would be decorated for Christmas all year long.” Sherman added a wreath at the window and holiday figurines around the space. A cabinet beneath the window holds a miniature Christmas tree, allowing room for all those letters to Santa in the mailbox beside it. SOURCES: holiday décor from Sharon Sherman’s private collection. The stage is set for an elegant soirée with lavish, draped garlands and a beautifully arranged table. SOURCES: all furnishings available through The Urban Dweller in Boonton. In the living room, Michael Mariotti, ASID, brought a classic Christmas story to life. Using the theme “The Night Before Christmas,” Mariotti honored the timeless holiday tale by creating a room that was just as classic—a tangible version of the cozy feeling the story inspires. Plush throws encourage lingering by the fire. A lineup of holiday-themed throw pillows invites snuggling on the sofas. An antique fire truck in front of the hearth harks back to the simpler time evoked in the story. Warming to his theme, Mariotti hung stockings by the chimney with care then stuffed them with gifts. Three wreaths above the fireplace—two small and one large—mimic the three stockings on the mantel—two smaller and one larger. SOURCES: holiday décor, Pier 1 Imports and Pottery Barn. Brightly colored floral arrangements play off the multi-hued carpet in the breakfast nook. 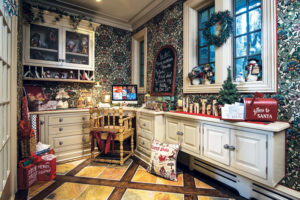 Visions of sugarplums were dancing in Anna Maria Mannarino’s head when she selected the holiday decor for this kitchen. Her additions to the kitchen bring a sense of coziness to the expansive space and fill it “with whimsy and childhood,” says Mannarino, allied ASID. Indeed, the decorative elements here are geared to those simplest of childhood pleasures—sweets! 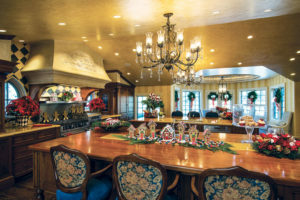 Gingerbread houses (and the gingerbread people who might occupy them) are given prominent positions on an island, shelf above the range and countertop. Gumdrops and lollipops make multiple appearances, as do snowy white frosted cupcakes. Poinsettias add a classic note. 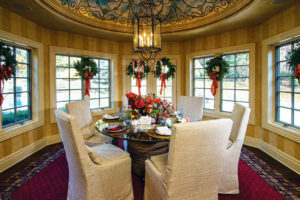 Red-ribboned wreaths surround the breakfast nook, hanging from windows and doors. Evergreen branches spread on an island act as a natural “runner.” Brightly colored floral arrangements round out the floral contribution, making this room a delight for all ages. 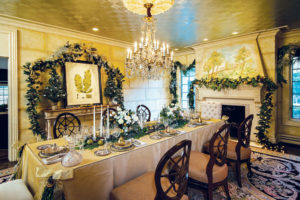 SOURCES: holiday décor, Anna Maria Mannarino’s personal collection; gingerbread houses and gumdrop trees, Jim Marvin Collection in Dickson, Tennessee; floral arrangements, Joanna Berkun Florals and Events in Suffern, New York. “Pine greens with hints of brown gold and persimmon are mixed with shimmering woven ribbon to set the palette,” Mary Sferra says. Burlap “antlers” (foreground) make whimsical napkin rings. 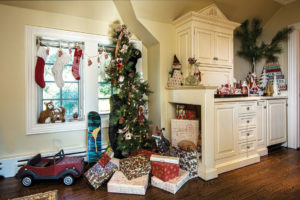 A pile of presents surrounds the tree, which is “dressed with small birds, bird houses, and woodland animals.” Pine branches in a tall vase sit on the countertop adorned with seasonal figurines. Woodland creatures—and the children who love them—play a large role in Mary R. Sferra’s design for the second-floor landing. Sferra did a bit of reminiscing when she decorated this space—her inspiration was a children’s book about a lonely doll who makes friends with a bear. “It’s an old, old series that I used to read to my daughter,” Sferra says. In honor of that story, stuffed bears abound. “Mother bear stands guard as her cub climbs the Christmas tree,” Sferra says. Another bear is seated comfortably reading a book. Other animals make appearances as well. A stuffed squirrel, keeping warm with a red and green scarf, occupies the windowsill beside a stuffed fox who sports a green ribbon (not shown in photo). A wire reindeer sits on a countertop. Owls and pinecones on the tree reinforce the woodland theme. SOURCES: area rug, Creative Touch in Secaucus; Christmas tree, Horchow; teddy bear, throw and pillows, Bloomingdales; holiday china and treats, Williams-Sonoma; assorted ornaments, Michaels and Pier 1 Imports; woodland animals, glitter reindeer, garland, ribbons, napkins and greens, Pier 1 Imports; angel with trumpet (on book shelf, left), Interiors by Denise in South Hackensack.